Eddie Peng as Wong Fei-Hung in Rise of the Legend. It looks good but it really isn’t. Rise of the Legend is a disappointing attempt to bring Cantonese folk hero Wong Fei-Hung back to the big screen with a hot young cast. The action is decent, but the story and characters come up short. OK as general audience entertainment. by Kozo: It was inevitable that Wong Fei-Hung would return to the big screen – the biggest surprise is that it took this long. Absent as the subject of a theatrical film since 1997’s Once Upon a Time in China and America, Wong Fei-Hung gets rebooted in director Roy Chow’s Rise of the Legend, a Batman Begins-esque look at Fei-Hung before he became the famed folk hero of Canton. This is a new take on Wong Fei-Hung that diverges substantially from previous fictional representations, though the filmmakers do carry forward the famous theme song widely associated with Wong Fei-Hung. The iconic theme is given reinterpretation by Shigeru Umebayashi (Wong Kar-Wai movies and, uh, Nightfall), resulting in a regal and respectful version that misses the bold and righteous feel of the arrangements from Tsui Hark’s classic Once Upon a Time in China movies. We’ve moved on from that era of filmmaking and the current trend is for Chinese movies that are more austere and less bombastic – but hey, those old movies were fun, weren’t they? It would be great if this new take on Wong Fei-Hung was fun too. It’s debatable if we get that fun but what we do get is Eddie Peng as Wong Fei-Hung, an inspired casting choice given Peng’s solid physicality. Jump Ashin! showed that Peng can handle action, and he hasn’t lost much of his buffed physique from Unbeatable either. The audience gets a taste of the Peng torso in a few loving camera pans across his rock-hard abs, the camera seemingly reversing direction more than once because it wants to fixate on that six-pack. Besides fan service, Rise of the Legend offers us the story of Wong Fei-Hung undercover in the Guangzhou triads. Known as “Ah Fei”, he rises up the ranks of the Black Tiger gang, quickly becoming the “Fourth Son” to leader Master Lui (Sammo Hung). As the other three sons – North Evil (Feng Jiayi), Black Crow (Byron Mann) and Old Snake (Brian Siswojo) – look on jealously, Ah Fei performs his triad duties while making surreptitious contact with the righteous Orphan Gang, led by childhood friend Fiery (Jing Boran) and tomboy Chun (Wang Luodan). Their goal: Take down Black Tiger. Rise of the Legend is a solid idea and the cast is well-chosen. Besides the aforementioned actors, Angelababy shows up as Orchid, a courtesan who’s Wong Fei-Hung’s confidante, and Wong Cho-Lam adds comic relief as Fei-Hung’s new friend Big Teeth. Zhang Jin has a supporting role as a rival gang member seeking revenge, while Tony Leung Ka-Fai appears in flashbacks as Fei-Hung’s venerable father Wong Kei-Ying. The story provides a workable framework for a decent commercial film. Christine To’s script replaces the nationalism and politics from Tsui Hark’s iteration with justice and vengeance, which makes the themes generic but also similar to the long-running black-and-white serials starring Kwan Tak-Hing. The structure, which cuts between Fei-Hung’s undercover activity and his formative years, effectively mixes exposition with action – except the action usually gets exposition anyway. As in Nightfall, Christine To has a habit of explaining events through dialogue even after we’ve seen them occur. A couple of characters will do something and then explain later what they were doing despite the audience being able to figure it out on their own. This script does some serious hand-holding. Not helping is the tone, which is reverent and portentous with only brief moments of humor offsetting the plodding seriousness. The film is paced too slowly, with nearly every scene opening with a crane shot and closing with a pan or fade-out. It’s like each scene is its own episode, and any build-up is lost in a monotonous parade of locations and conversations. Emotional connection is also poor; the central dynamic between Wong Fei-Hung and Master Lui is weak because Fei-Hung never seems to care much for the “mentor” that he’s betraying. The romantic relationships fare worse. The filmmakers offer a verbalized love rectangle between every young actor in the film (minus Wong Cho-Lam) that fails to create tension or heat. Combine all this with the film’s exposition problems and you have an action-drama where the talking diffuses the action. These are not new issues for the Roy Chow-Christine To pair, whose attempts at storytelling have long come off as slavish adaptations of overwritten screenplays. Film is a visual medium, remember? Also, the film doesn’t convince when exploring themes like vengeance or corruption. For example, a character warns the undercover Fei-Hung that he should be wary of toppling the corrupt head of the triad, because once you replace him, you’ll be just as bad. Such pontificating would be fine in another film, but this is a Wong Fei-Hung movie. Wong Fei-Hung will not turn evil, so why even act like such dialogue carries any weight? Also, if the filmmakers are attempting a dark, corruptible take on Wong Fei-Hung then they botch that goal; Eddie Peng’s demeanor as Fei-Hung is too decent, and the character is poorly developed. This Fei-Hung is a naive justice-seeking youth who meets tough situations, but the character grows passively in that he doesn’t get to learn from his own mistakes. Furthermore, Eddie Peng doesn’t play to his strengths: his natural charm and boyish charisma. Kwan Tak-Hing made Wong Fei-Hung venerable and wise while Jet Li gave him a forthright and righteous temper. Eddie Peng’s main contribution to Wong Fei-Hung is that he cries a lot. On the plus side, technical work is excellent, and the action sequences from Corey Yuen are sharp and entertaining. The action in Rise of the Legend has more in common with the stylized video game-like brawls of The Matrix than the dynamic martial arts of the Once Upon a Time in China series. The choreography features lots of slow-motion and stylish camera moves, but thankfully less shaky cam. Some techniques are jarring; occasional POV shots during the action don’t really work, and detractors of CGI and wires will be unimpressed by how much of it the filmmakers use. Purists versus casuals debate aside, the actors carry the martial arts fine. 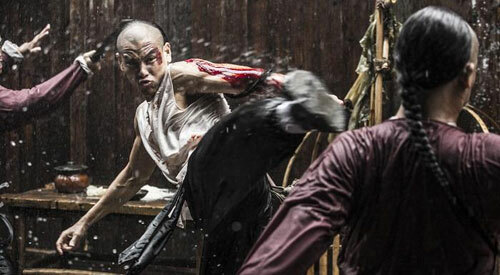 Eddie Peng fakes his fighting quite well, and each set piece has something to recommend it, from a one-versus-dozens standoff in the rain to a CGI-fest weapons fight with Max Zhang. Sadly, the final fight – set in a blazing warehouse – is anti-climactic and most notable for all the pauses where someone says, “Are you hot?” Since he’s talking to Eddie Peng, the answer is obviously “Yes” – in more ways than one. Notes:  The “Wong Fei-Hung theme song” referenced in this review is a four movement Tang Dynasty (618-907) composition called “The General’s Orders” (將軍令). The theme became linked with Wong Fei-Hung through the films starring Kwan Tak-Hing.  Given Wong Fei-Hung's roots as a Cantonese hero, he and everyone else in the film should probably be speaking Cantonese. However, the film was largely distributed to cinemas in Mandarin.